When it comes to controlling pH in process water and waste water in large-scale containment basins or ponds, not all pH control systems are created equal. Many times, the high-pH liquids that must be neutralized also contain high concentrations of dissolved solids, in addition to sludge and solids in suspension. This causes the buildup of scale and other substances that will foul and clog traditional pH control systems, causing the need for expensive regular cleaning, maintenance, and repairs—as well as the downtime the comes with it. 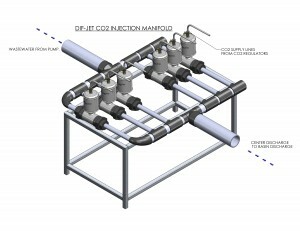 Enter the patent-pending Dif-Jet™ CO2 injection manifold (pictured left), a unique approach to CO2-based pH control systems: one that cannot be clogged, scaled, or fouled, no matter how dirty the water. The Dif-Jet works by injecting any type of gas—in this case, CO2—into water, yet it requires no moving parts or narrow nozzles, so there’s nowhere for scale and solids to build up and no small holes to clog. Now, there’s a practical and economical way to control the pH of waste water, process water, and others. By selecting a powerful pH control system from Fortrans, Inc., you’ll use less CO2 to neutralize more water without the risk of downtime due to cleaning or maintenance requirements. Using the Dif-Jets saves an extensive amount of time, money, and hassle for our customers in many different industries and markets. There are many ways of incorporating the Dif-Jet into pH control systems designed for various volumes of water and various flow rates. Pictured right is one example. Notice the integration of 12 individual Dif-Jets, organized into two discreet banks. This system is capable of treating water flowing down a high-capacity (12-inch or larger) pipe—up to 5,000 to 8,000 GPM, in real time, using 250 pounds of CO2 per hour. This system also includes a dedicated pump to maintain optimal water pressure inside of the Dif-Jets, and the pump also ensures that the pressure and flow rate in the larger pipe is unaffected by the pH control process. 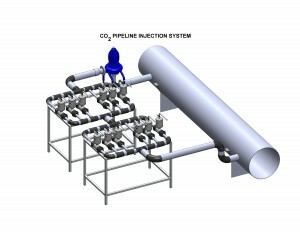 Pictured left is a closer view of part of an inline CO2-based pH control system using the Dif-Jet injector. From this diagram, you can see that the high-pH water enters the system and is split between 6 discreet Dif-Jets. Each of these Dif-Jets has, as standard, a typical 1/2-inch hoses routed to the source of the CO2. 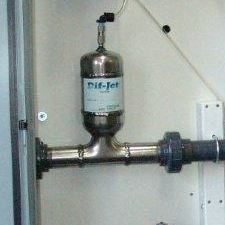 As the waste or process water passes through the Dif-Jet’s internal structure, it is brought into contact with the CO2 at just the right pressure to cause efficient dissolution of the CO2 into the water. It all happens in real time. 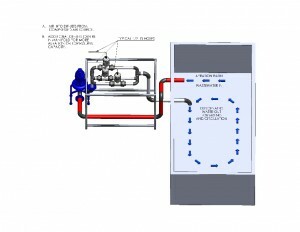 The pH-controlled water then exists the Dif-Jets and are merged back into a single pipe to be discharged into a basin or routed off site for safe, environmentally-friendly disposal. In the pH control system pictured to the right, you can see an example of how the Dif-Jet can be put to use neutralizing the pH of process water or waste water that’s already in a storage tank up to 150,000 gallons. One pipe (pictured red), near the surface of the water, is connected directly to a pump (pictured blue), which draws water out of the basin. This pump forces the water into the Dif-Jet array, where it is injected with CO2 gas for pH control. The neutralized water is then fed back into the basin in a manner which promotes mixing and circulation. Using a system like this, along with one of our powerful pH monitoring systems, allows you to maintain a specific pH level in a basin or pond while additional high-pH water is continuing to be added. Fortrans, Inc. offers a selection of CO2-based pH control systems, each incorporating the Dif-Jet to suit a variety of applications. Click a page listed below to learn more about each of our CO2 pH control systems, and we encourage you to contact us today to speak to a sales representative for assistance selecting the ideal CO2 pH control system for your needs. Also, please explore all of the available 5000-system accessories for your facility’s pH control system from Fortrans. Contact Fortrans, Inc. today to discuss your facility’s pH control system requirements. We are available online or by phone at 866-958-7267.